Hello my friends!! Welcome to a fun blog hop celebrating National Craft Month! All month long, crafters are taking pride that a whole month is dedicated to a hobby we love! We all craft in different ways, and this blog hop is showcasing some of those fun creations! I am thrilled to be taking part in this fun blog hop headed up by the fabulous Nicole of the Right At Home Shop. ( no pun intended) teehee! I usually don't make Easter cards, as I really don't have anyone to give them to, but I couldn't resist using the Lawn Fawn inks to create this fun jelly beans and to pair it up with the yummy new papers that Lawn Fawn has released in their Perfectly Plaid 6x6 papers! For the jelly beans I used - Plastic Flamingo, Carrot, Juice Box, Sunflower, Jalapeno, Celery Stick, Butter and Merman! I die cut a piece of my favorite white card stock from the scallop rectangles dies from Lawn Fawn ( they are my favorite at the moment) as well as a piece of the plaid pattern paper that went SO well with the jelly bean background! I took a piece of scrap white card stock and die cut a stitched circle, and also used some of the new Jalapeno card stock from LF, and die cut some grass using the grassy border die and then took that same stitched circle and die the grass as the bottom to fit my circle perfectly. I took some Tumbled Glass distress ink and blended that onto the top portion of my circle to give it a sky look. I, then stamped my hopping bunny and added a little color to him with C1, R20 and my colorless blender. I used the coordinating die to die cut him out and added some foam tape to the back. I put all the elements together onto an A2 top fold Merman card base. 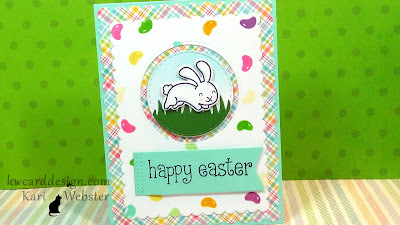 For my sentiment, I die cut a banner from the Large Journaling Card die set and stamped the "Happy Easter" sentiment with Memento Tuxedo Black ink, and for some final touches, I added some Wink of Stella to a few of the jelly beans. Isn't fun and colorful!! Well, of course this is a celebration, and with a celebration, comes prizes! You will have a chance to win some fun goodies by heading over the the RAH Blog! This will take you directly to the blog post to enter! Next up is my friend Laurel! I am sure she has something fun to feast your eyes on as well!! Have fun on the rest of the hop! And, Happy National Craft Month! What a super fun Easter card! Love the plaid. The LF inks are so vibrant! Love your cute card!!! I been looking forward to seeing this since you showed it on IG. Love!! Love the plaids, a darn cute creation! The plaid paper is perfect! And I love the jelly beans! They look like they are bouncing all over the card! The papers you used on this are adorable! Such a lovely and happy card! Adorable! Super cute card!! Love those papers and the bunny! Fun Easter card love the plaid. Saw sneeks on ig and fun to see the whole cute card here! If you need someone to send this gorgeous Easter card to, I will happily apply, 😍 I love Lawn Fawn as well and have been dying for the new paper as well as several of the new stamp sets! Thanks for making m smile with your beautiful card. Your wee bunny, surrounded by the yummy jelly beans, is cuteness galore! Absolutely delightful! Cute card, love all the colours you have used, makes it such a celebration card. What a great Easter card! Love it! this card is full of elements that I absolutely love. The first is the plaid paper which I absolutely love. The colours in it are so fun, bright and springy and I love the way the jellybeans in the background so perfectly match the colours in the plaid. 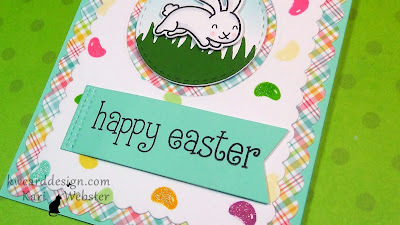 I also love the playful hopping bunny in the middle of the card and the fantastic way the card base colour and the sentiment base colour match perfectly tying this lovely card together. Super fun! This is the cutest, springy card. Love the colors and especially the bunny! 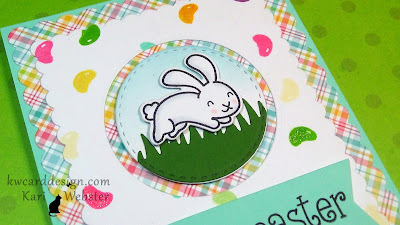 cuteness, the bg paper is perfect for this bunny! Very cute! Love the colors and patterns! way too cute. Lawn Fawn bunnies are adorable. LOVE your CHEERY colours and PRETTY layers, LOVE your bunny & beans too!!! What a cute Easter card! I love the colors. SO FUN! I love the jelly beans! And I just got my Lawn Fawn plaid papers in the mail and can't wait to use them! Great card - thanks for sharing! LOVE your card! I'm a huge Lawn Fawn fan, too. What a cute Easter cards... love that plaid paper. this card is so cute with the jelly bean background!! Kari, the comment box isn't showing up for me, so I'm putting replying to the last comment to get mine in! I don't know what's wrong! Anyway, I love your Easter card with that adorable bunny! same problem here! adorable card!! So darling! That plaid paper is the perfect match for your jelly beans!!! Adorable Easter card!!! Love the plaid and those gorgeous ink colors!!! So happy and fun! Such a cute colourful and cheerful card, love it! Your Easter card is adorable. Love the colorful jelly beans also! Your Easter card is AWWW-dorable. Thanks for sharing.